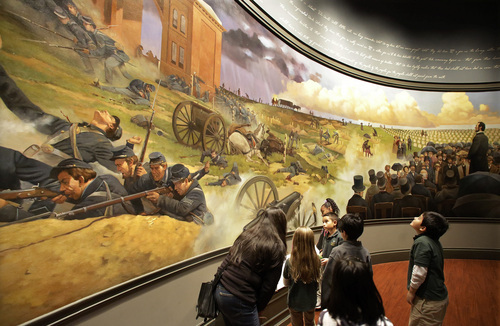 Lessons • From Pennsylvania battlefield to Utah schools: Students and families learn President Lincoln's Gettysburg speech. 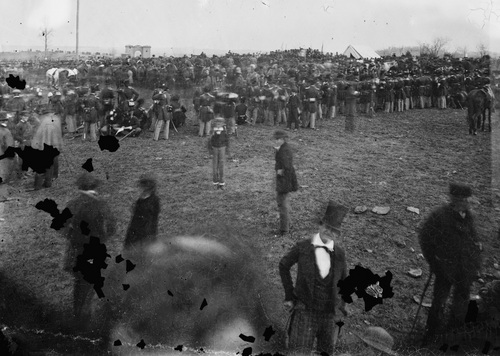 Abraham Lincoln likely would be stunned at the sight: a class of nearly 30 teenagers with roots in Africa, Asia, the Americas, the South Pacific and Europe reciting in unison the speech he gave at the Gettysburg cemetery 150 years ago. 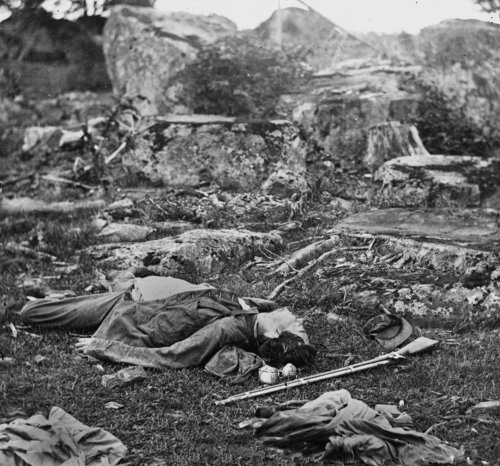 After all, the 16th president expected the bloody sacrifice of 51,000 dead and thousands maimed at Gettysburg, not his words, to be remembered. 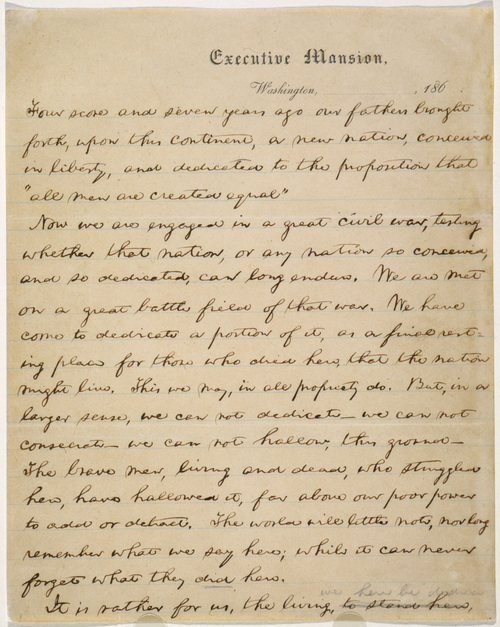 But the Gettysburg Address, delivered on Nov. 19, 1863, remains a testament to principles Americans hold dear, and it has captured the imagination of this U.S. government class at West High School in Salt Lake City and classes throughout the state. 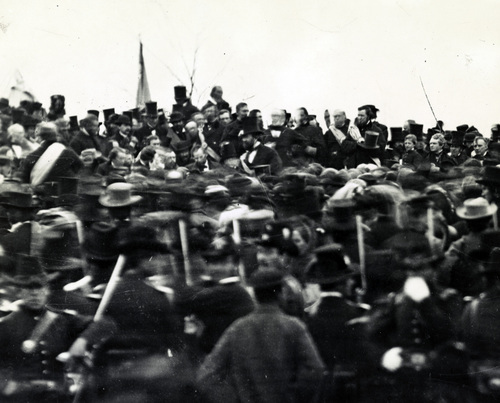 Just as West High students memorized the speech so they could recite it at Monday night&apos;s Jazz game, dozens of classes and families throughout Utah are making a project of the Gettysburg Address this fall. More than 10,000 students have led crowds at halftime during college, Jazz and Real Salt Lake games  with the words of Lincoln&apos;s two-minute address displayed on overhead screens. They&apos;ve gone into nursing homes to teach  or remind  elders how to recite the speech, and they&apos;ve performed at countless school assemblies and in videos posted on national and local websites. 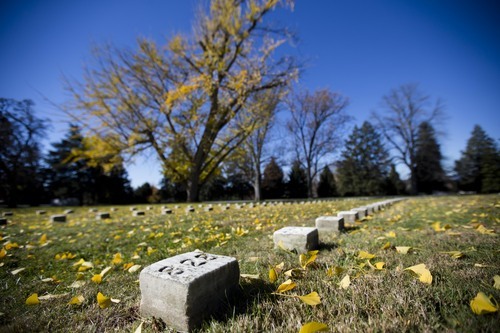 The Mormon Tabernacle Choir focused on Gettysburg in its Veterans Day program and grandparents throughout the state are planning Gettysburg discussions for Thanksgiving Day. "It&apos;s because the Gettysburg Address contains foundational principles upon which this country was established," says John Adams, the Salt Lake City attorney who co-founded the nonprofit GettyReady last summer. &apos;A challenge to all Americans&apos; • Adams and the general managers of KUED and KBYU created GettyReady after hearing documentarian Ken Burns discuss his latest project, "The Address," at a Public Broadcasting Service meeting in Florida last spring. 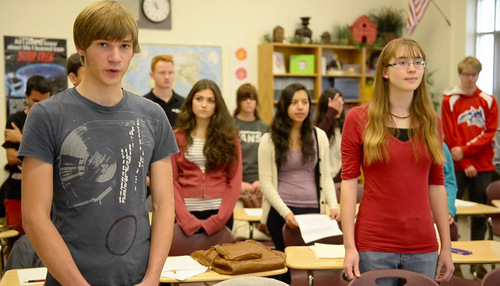 GettyReady enlisted teachers and principals to raise awareness of the speech and its message. It also put up billboards to promote the project. The principles of equality, liberty and civic engagement, Adams says, are "principles those of us involved feel strongly the rising generation needs to learn about and apply in their lives." The message is not lost on West High students. When Kristie Goddard, the West High teacher, asks how Lincoln&apos;s speech is relevant today, Tim Quah and Harrison Patton have answers. "It&apos;s a challenge to all Americans to actively participate in democracy," says Quah. "It&apos;s important to understand the sacrifices that were made so you can appreciate the freedoms we have today," adds Patton. West High senior Shakri Mohamud says Lincoln&apos;s words are especially poignant for immigrants like her parents, who are from Somalia and Saudi Arabia. 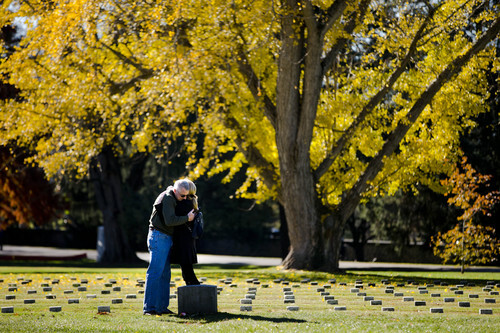 "Regardless of time," Mohamud says, " … the heart and meaning of this nation has not changed." &apos;Are we there yet?&apos; • Robert Turk has been dressing in a Confederate soldier&apos;s uniform and challenging his fifth-graders at Blanding Elementary to memorize the Gettysburg Address for 15 years. This year, two dozen of his students took up the task; on Tuesday, he&apos;ll learn how many of them succeeded. But for Turk, whose great-great-great grandfather was a Confederate officer who fought at Gettysburg, Lincoln&apos;s famous speech is but a starting point for other history lessons. "I tie everything back to the Declaration of Independence," says Turk, noting that, in 1776  the "four score and seven years ago" Lincoln referred to  the noble words of equality applied only to white men. 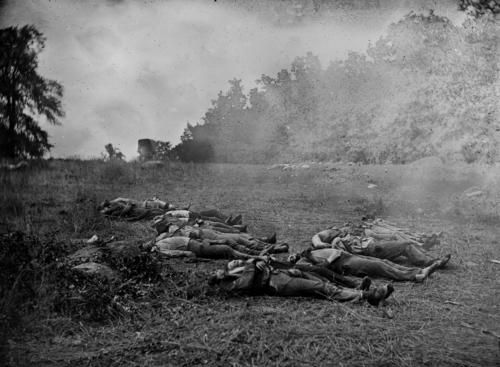 By Gettysburg, there was the as-yet-unrealized notion that blacks, too, were equal. 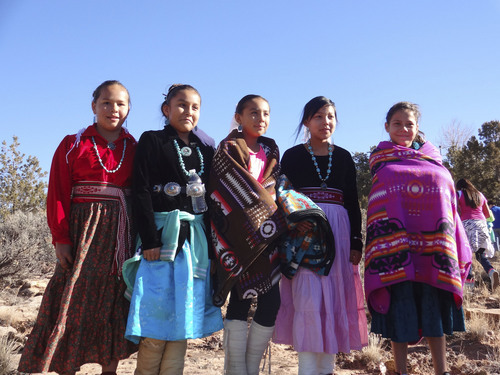 Indians, including many of his students&apos; Navajo and Ute ancestors, certainly were not yet equal. The year after Gettysburg, 8,000 Navajos were forced from their homes in northern Arizona and northwestern New Mexico and marched hundreds of miles to a reservation in desolate southern New Mexico, near the Texas border. 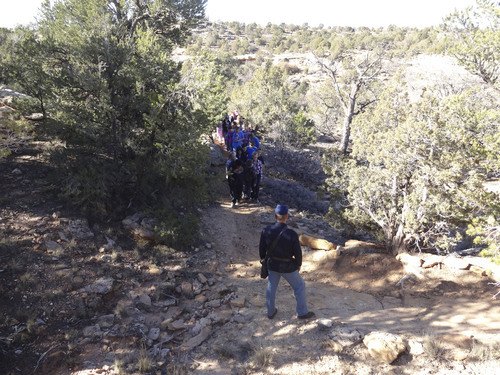 Each November, Turk and his students re-enact, in a canyon near Blanding, the Long Walk  and the return years later  of the Navajos. "The question I ask in 2013," Turk says, "is &apos;Are all men equal? Are we there yet?&apos; "
&apos;Do civics&apos; • Isaac and Angela Jacob of Orem saw the GettyReady billboards this fall and decided it would be fun to challenge neighborhood kids to memorize the speech. So on Halloween, the family passed out Dum Dum suckers attached to pieces of paper challenging children to return by Nov. 19 and recite the Gettysburg Address by memory. The promised treat was a full-size candy bar. By Monday, only nieces, nephews and the Jacobs&apos; two oldest children, a kindergartner and a first-grader, had earned candy bars. "We&apos;re hoping that tonight or tomorrow we&apos;ll get some," Jacob says. GettyReady, though, is not just about memorizing a historic speech, says Michelle Oldroyd, who teaches at the University of Utah&apos;s S.J. Quinney College of Law. She&apos;s the project director for the nonprofit. During the winter and spring, business leaders and professionals will go into classrooms to talk about the role of civility, respect and courage in their work lives. There may be essay and video contests. "We&apos;re going to challenge young people to apply President Lincoln&apos;s speech," Oldroyd says. That already is happening, she says. A teacher in Davis County called to recount the effect on one little boy who often missed school because of bullying, Oldroyd says. The boy&apos;s parents suggested they come into the class and teach an anti-bullying message in connection with Lincoln&apos;s famous speech. The boy, who had it memorized, was given the job of teaching the rest of the class. "He hasn&apos;t missed school in three weeks," Oldroyd says. Tami Pyfer, a member of the Utah State Board of Education, says students will be asked to think about the meaning of the speech today. "Does it mean we need to be better at conflict resolution? Or at safeguarding our liberties?" asks Pyfer, who works as a program specialist for the Utah Commission on Civic and Character Education, which is partnering with GettyReady. "We want [students] to not just study history or study civics. We want them to do civics," says Pyfer. "You can learn about it in school, but how do you do it?" 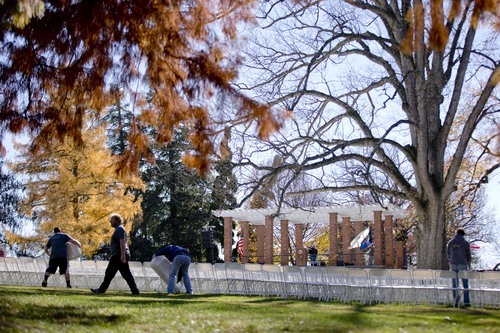 No central public event is planned in Utah on Tuesday to commemorate the 150th anniversary of the Gettysburg Address. 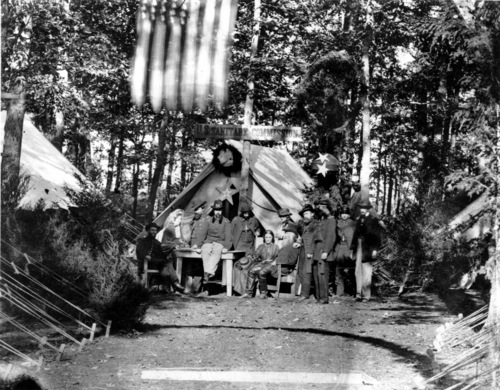 However, a group of 50 Salt Lake City high school students will take part, by video link, in The National Park Service&apos;s Dedication Day Ceremony at the Soldiers&apos; National Cemetery in Gettysburg, Pa. The event will be streamed live at GettyReady.org and shown on UEN-TV Channel 9. The event begins at 8 a.m. MST.